I remember playing with my chemistry set as a kid and getting the idea to mix together everything that said “poison” or “danger,” which seemed the only natural thing to do. The result was a chalky light blue concoction that was strangely cold to the touch. Thankfully, I had enough brains not to drink said concoction, so if it had turned out to be an invisibility potion the recipe is sadly lost to history. Regardless of the result, there’s a certain freedom and exhilaration that comes with mixing together unknown ingredients and seeing what happens. Alchemists is a light-hearted, humorous yet surprisingly deep and strategic game that allows players to experience the rush of scientific discovery with an excellent mix of deduction and guesswork. In Alchemists, you are an aspiring alchemist (surprise surprise), with dreams of achieving academic reknown, as you attempt to puzzle out the secret formulae to any of six different potions, three of them bestowing beneficial effects like Wisdom, Speed and Healing, while the other three are a little on the nasty side (those are the ones you’re going to want to give to your students). Potions are made by mixing two ingredients, each with a particular alchemical quality, drinking them and seeing what happens. Now, there are eight separate “alchemicals” in the game, each with three distinct aspects: red, blue and green. Each aspect can be either large or small, positive or negative. If you compare two of these alchemicals, in most cases one of the colors will have the same sign yet different sizes. For example, you’d see a small red plus on one and a big red plus on the other. Whenever a small and big of the same color and the same sign are mixed, it results in a potion of that color and sign. 3 total colors, 2 total signs…some high-school math tells me that adds up to the 6 potions I just mentioned. Simple enough, eh? Well that’s the trick. 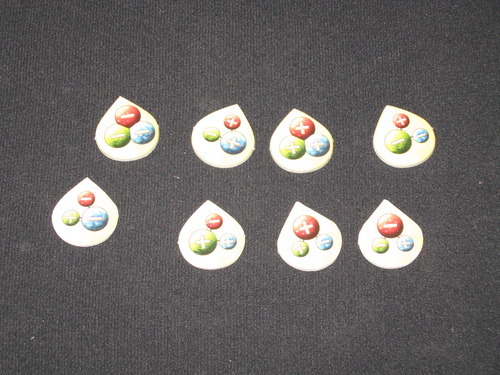 At the start of each game, you don’t know which of the eight ingredients (shown on the cards below) represents which of the eight alchemicals (shown above). If you combine chicken-foot and bullfrog, that might create a blue negative potion, but you still don’t know exactly what chicken-foot is, let alone what it will do if you mix it with mandrake. Mixing blue negative only gives enough information to eliminate four of the eight possibilities from each ingredient. Pop quiz: what information have you learned? Well, since you made a blue negative potion with those ingredients, their blue aspect must include a negative and you can cross off the four possible alchemicals that contain blue plusses. Hooray for science! The theming in Alchemists is excellent. The game does a fantastic job of creating an atmosphere of mad-scientist academia, not only with the stunning art and top notch production value of the components, but the way in which the game incentives and scoring actually work. From the recognition of publishing a ground-breaking theory and bragging to colleagues about it, even with scant proof, to the disgrace of being exposed as a fraud before the academy, the game nicely captures this dynamic all with a touch of humor. The rulebook for this game is truly funny and is a pleasure to read. As this is one of those games where you will want to spend some time with the rulebook, thankfully they have made it worth your while, even beyond just learning to play the game. Now you might have heard by now that playing this game requires the use of a free smart-phone app. It does. Thank the Lord it does. Because the app is your friend. In fact, it’s what enables this entire unique experience called Alchemists in the first place. First, the app acts as an automatic randomizer of the approximately 40,000 ways eight alchemicals can be assigned to the eight ingredients. Also, by “looking” at the ingredients by means of your camera, it will tell you what potion you’ve created. Trust me when I say that this is difficult to do in analog without accidentally revealing exactly what each ingredient represents. Basically, if you want to play this game without the app, you can, but you will need a helpful friend to act as Ledgerman, a la “The Cones of Dunshire”. So, good luck with that. Nevertheless, the best part about the app is how unobtrusive it feels. Alchemists remains in every respect, very much a board game. There is a reason we’ve never really had a game like this and why it feels so unique — it’s because of this little app. So feel free to complain about it, but I would highly suggest trying it out first. But enough about the app. Once you’ve mixed your ingredients and made a potion, as long as you have the ingredients to make it again, you can make a few bucks by selling it to adventurers who come traveling by your little college. In addition to cashing in for some big money on a potion you know you can make, on the other hand, you can risk your good reputation by selling them the wrong potion and try to glean a bit of information in the process (“hmm, I said I was going to make green plus but I guessed wrong – that means it must have been a negative potion.”). As you continue to brew potions, which you test out by either giving it to your hapless students, to unwary adventurers or by drinking it yourself (watch out for those negative potions! ), you’re trying to figure out exactly which ingredients correspond with which alchemicals. Before long, and probably before you know exactly what anything really is, you’ll have to publish a theory. When you do this, you basically make a public guess about which alchemical goes with which ingredient. You pay a coin to the publisher and you place one of the eight alchemical tokens on the publishing board next to the ingredient you think it is. For doing this you get a point of reputation. If you’re the first to get two published theories, you can claim a grant which awards immediate funds (to further your illustrious research) and is also worth points at the end of the game. The board gets pretty crowded with four players, so in addition to publishing your own theories, you can affirm someone else’s. You pay the same coin to the publisher but you also pay a coin to the original author. The decision of whether to wait for more information vs. go with your gut and publish now (aka, guess) is a compelling aspect of the early phase of the game. The points you receive for publishing get you out in front and the extra money in the form of grants can help propel you through to the endgame. And you don’t even have to be correct! Additionally, at the end of each round, the player with the most seals on the publishing board gets an additional point so it really pays off to be first to the punch here. As a game mechanism it does an excellent job of driving the narrative of the game, getting players to take risks, publish before you’re altogether ready and effectively putting a limit on just how studious one can be. If you wait till the very end you may know all the answers, but someone else will have gotten all the glory. Sometimes you need to stick your neck out a bit to get noticed in this crazy world of academic alchemy. If you find yourself with some extra cash, there are various magical artifacts that players can purchase that give a wide variety of special abilities. The random selection of artifacts dealt out at the beginning of the game inject some more interesting variability in the game and help to support an alternate strategy based on selling potions and buying artifacts, rather than publishing. But lest this game seem like solitaire, just picking cards, testing potions, checking off possibilities from the solitude of your lab, let me assure you that the player interaction in this game is very high. Most notably, the game gives you the opportunity to debunk your friends’ awful theories. This is my favorite element of the game and mechanically serves as a counterbalance to the rush to be published and puts a bit of fear into the hearts of otherwise too enthusiastic theorists. Debunking a theory is worth even more points than publishing and penalizes the players who promoted that hogwash in the first place. The game offers two modes, apprentice and master and about 90% the difference between them is within the debunking action. In apprentice mode, debunking a theory is fairly easy, whereas in the master variant, you have to show an actual proof, which is a) more difficult and b) gives away less information to opponents. Significant player interaction occurs also in selling potions, where players can be outbid from the process altogether, and in turn order which can lead to some “you took my spot” moments that will be familiar to most worker placement / action selection fans. All in all this is a truly excellent game that feels thematic, strategic and fresh. There’s a healthy mix of boardgame strategy in terms of resource management and engine building, as well as the deduction and guesswork aspect with a hint of Sudoku-style information triangulation. At the end of six rounds, after all is said and done, you have the opportunity to wow the judges and your fellow players at the alchemistry exhibition with your mastery of the various potions. Or fall flat on your face. Not pretty, but I’ve seen it happen! Alchemists is an excellent title with top notch production value. With a fun and fresh theme, mechanics that are wholly unique in boardgaming, and beautiful components, this game has a lot to offer. Play scales well from 2 to 4 although the game is at its best at higher player counts. Alchemists rewards and encourages repeat play as it truly is new every time.